Heat oven to 350°F. Spray 15x10x1-inch pan with nonstick cooking spray. Line bottom of pan with waxed paper; spray paper with cooking spray. Make cake mix as directed on box using water, oil and eggs. Pour batter into sprayed paper-lined pan. Bake 18 to 20 minutes or until cake springs back when touched lightly in center. Cool cake in pan on wire rack 10 minutes. Invert cake onto wire rack; remove pan and paper. Cool completely, about 15 minutes. Meanwhile, in medium saucepan, melt chocolate over low heat, stirring constantly. Remove from heat. Stir in almond extract. Cool 10 minutes or until slightly cooled. Genlty stir cooled chocolate into whipped cream. Trim edges of cake. Cut cake lengthwise into 2 long layers. Place 1 layer on serving platter. Spread with 1/3 of mousse. Repeat with remaining cake layer and 1/3 of mousse. Place remaining 1/3 of mousse in pastry bag fitted with star tip. Pipe border around bottom and top of cake. Decorate top of cake with mousse rosettes. Sprinkle top with almonds. Store in refrigerator. *To toast almonds, place them on cookie sheet and shake to form a uniform thin layer. Bake at 350°F about 7 minutes or until they are just golden. For even toasting, shake the pan once or twice during baking. Mousse is French for froth or foam. Sweet mousses are cooked custards made with fruit puree or chocolate, gently combined with beaten egg whites and chilled. 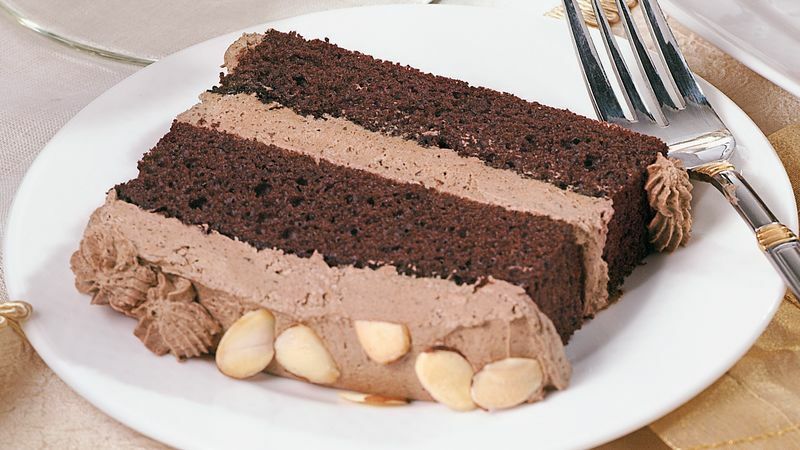 The almond-flavored chocolate mousse in this cake takes an easy, quick shortcut — it's simply melted chocolate folded into whipped cream. Bake the cake in advance, let it cool, cut as directed in the recipe and wrap tightly with plastic wrap and foil. Seal it in a food-storage freezer plastic bag and freeze it up to three days. Prepare the mousse one day in advance. Early in the day, assemble the frozen cake with the chilled mousse; cover and refrigerate. Remove the dessert from the refrigerator one hour before serving. This pretty cake only looks complicated; it's actually a snap to put together. It looks elegant on the dessert table and it serves a crowd.